Researcher helps you find and cite reliable sources for your research paper in just a few steps. Note: Researcher is available only in English, French, Italian, German, Spanish, and Japanese. On the Reference tab, in the Reference group, choose Researcher. The Results pane shows a list of sources you can use in your document. 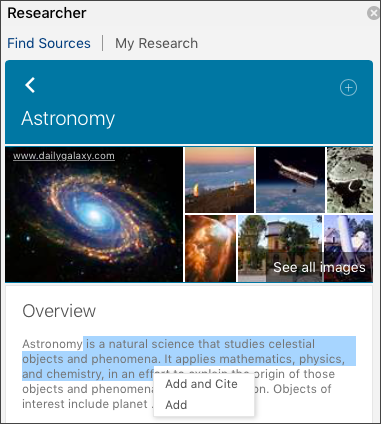 Tap the plus sign on the upper right hand corner of on any result to begin an outline for your research topic. This adds the result as a topic heading in your document and saves a link to the result in a comment. Choose Add to add only text to your document. Choose Add and Cite to add text and also include citation for your source. After you add text or image, you are prompted to update your bibliography. Choose Update to automatically create or update your existing bibliography. 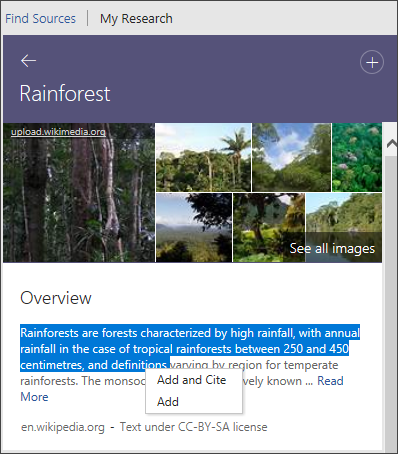 To edit, choose the citation and select the drop-down. See Add or change sources, citations, and bibliographies for more information. On the Reference tab, choose Researcher. See Editing citations for more information.